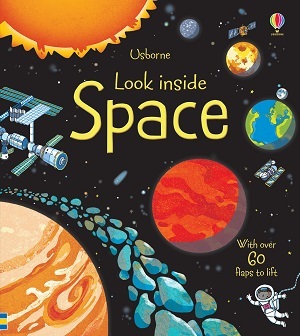 To further understand what happens beyond our world and sky, I’ve been looking at some information space books for children. and progresses quickly on to how stars are born. The illustrations are friendly and yet informative – cute pictures of astronauts asking questions, but also good representations of what the different planets look like. It doesn’t feature the solar eclipse, but does have a lovely section on the history of star gazing. Aged 5 and over. 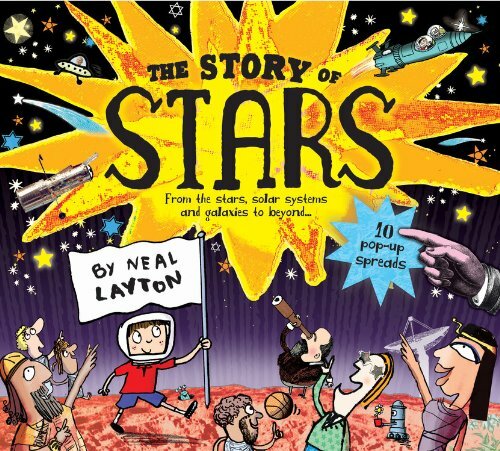 My other favourite for this age group is Neal Layton’s Story of Stars, which I reviewed here. 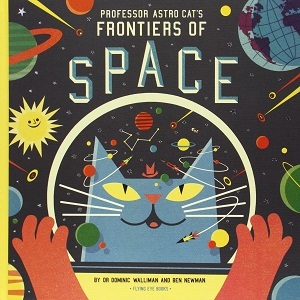 For further inspiration at a slightly older level, try Professor Astro Cat’s Frontiers of Space. Told in a chatty way, as if the Professor is talking directly to you, the book talks through many topics including the universe, birth of a star, galaxies, the sun, solar system and all the different planets, space travel, telescopes, the death of stars and the future. Each page is jam packed with information told in little nuggets with illustrations and also graphics to explain things. There are also funny pictures of Professor Astro Cat along the way to liven things up, but not in too childish a way – more comic like. The colours are muted but the pages feel lush and textured, so that you almost feel as if you’re looking through an art book, but about space. There are nice touches, such as explaining how big the planets would be if Earth was a cherry tomato, and using a balloon to show how a rocket works. There is so much information in this book that it has striking longevity and yet at no time seems overwhelming. The humour jumps out of every page too. A clever book, teaching facts while inspiring children. There isn’t an index, and I couldn’t find information on a solar eclipse, but I was struck by the illustrations and guide to constellations, and spent a great deal of time looking at this. Aged 8 and over. 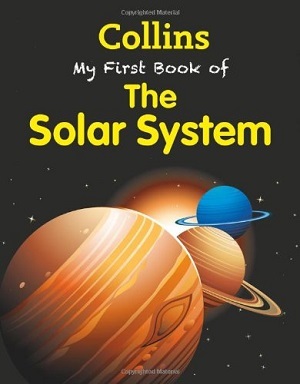 For those children who just like hard facts without any of the illustrations or extra gimmicks, Collins My First Book of the Solar System suits the bill. Although the artworks are all detailed photographs taken in space or by telescopes, the layout and presentation is unexciting and fairly uninspiring. Saying that, this came top for one of my child reviewers, simply because the information is starkly laid out making the facts accessible and easy to gather. Each planet has a fact page, with crucial information such as length of day, distance from sun, diameter etc. There are graphics to show orbits and position in space, as well as a timeline of man’s exploration of space. A quiz and comprehensive glossary at the back, with clear text throughout. It does feature both solar and lunar eclipses on the moon page. Recommended for fact gatherers aged 8 and over. 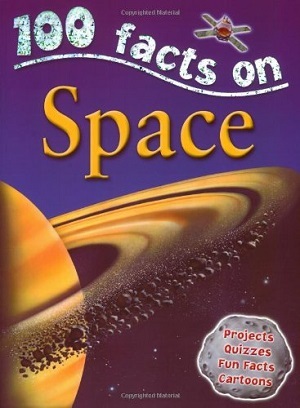 Other series that have titles on space and are frequently found in school libraries, although maybe not so much in homes, because they tend to look more educational are 100 Facts: Space, and Fact Cat the Moon. 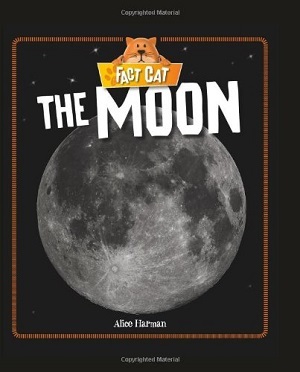 Much more ‘educational’ looking than those reviewed above is Fact Cat the Moon from the Fact Cat series of space books, each title of which goes into slightly more depth on each subject. It features photographic graphics rather than illustrations, each clearly labelled, and asks questions of the reader as well as giving easy to understand information. The book covers topics from what is the moon? to its surface, inside, cycle, and man exploring the moon – but each page is fairly simple and contains the minimum of information to suit the age group. I couldn’t find anything about solar eclipses, and I was frustrated by a rather silly demonstration about the moon’s orbit, but I liked that it included information about tides. Aged 6yrs and over. 100 Facts about Space is more exciting and has 100 paragraphs throughout the book giving information – illustrated with a mixture of photographs and artworks. There are cartoons interspersed with these paragraphs, entitled ‘I don’t believe it’ giving extra facts, and some good graphics, such as the moon cycle, and location of the planets. There is a feature on solar eclipses, and a diagram to show what happens. It’s a colourful and lively book. Aged 8+.